It is absolutely impossible to experience God’s peace when I’m reliving yesterday or pre-living tomorrow. Peace simply cannot be applied to yesterday’s mess nor can it be pre-applied to tomorrow’s worries. Have you ever gotten to the end of the day and regret the amount of time you wasted on guilt, worry, and anxiety? But I’m working on changing that. I truly believe that with God’s help I do not have to sacrifice today’s peace and joy to yesterday’s failures and tomorrows unknowns. But I definitely need His help. So, I’m working to apply the following disciplines every day … because I know when I do, well, I have the peace I want! 1. Celebrate today like it’s a bonus day. Rev and I celebrate bonus days. In fact, today is our 4,176th bonus day. They are the days we’ve been blessed to enjoy that were unexpected when he entered the operating room on September 20, 2007, for a pericardial stripping. What’s that? A pericardial stripping is when a cardiac surgeon chips the thickened and hardened lining off a beating heart. It’s extremely dangerous. We were told the mortality rate, morbidity rate, and success rate were all equal. We weren’t offered a lot of hope. And yet, God gave us His peace that day. And every day since Rev has written the Bonus Day number on the calendar as a reminder to celebrate and LIVE. This is the day that the Lord has made. Let us rejoice and be glad today! When we are busy treating today like the gift, the bonus, it is … well, it helps us to live intentionally. And intentional living focuses on now, refusing to dwell on the past or on the future. 2. Take every thought captive . . . purposefully reject guilt and worry. I once read about a great idea that can help me seal today off from yesterday and tomorrow. Living in an airlock space. Imagine as you walk into today that the door to yesterday is closing behind you and you can’t open the door in front of you until it’s time to move into tomorrow. Enter the airlock space with thanksgiving and leave it with repentance. No guilt and no worry. 3. Do only what you are able to do today. When is the last time you were able to accomplish everything on your to-do list? It’s impossible to get it all done. So, remember to manage each day with grace. It’s okay to say “no.” It’s okay to set priorities. In fact, it’s not only okay, it’s God’s will. You absolutely cannot do everything for everyone. So, spend time with God and your planner. Pray and ask Him to help you manage your time according to His plans and purposes for you. You may find that it’s time for you to say “no” to some good things so you can fully say “yes” to the most important things. 4. Trust God to meet your needs today. Have you read the Bible account lately of the way God provided food for the Israelites in the Wilderness? One day at a time … just enough. With the exception of Fridays, when they were told to gather enough for the Saturday Sabbath so they could rest as God commanded. God is able to meet today’s needs. And He will even meet them in ways that make it possible for us to take a Sabbath rest if we trust Him. And it’s impossible to have peace when my “little faith” doubts His ability to meet my needs. Look at the birds in the air. They don’t plant or harvest or store food in barns, but your heavenly Father feeds them. And you know that you are worth much more than the birds. 5. Just breathe. Breathe in His peace and breathe out the peace robbers. When the moment is difficult and I’m tempted to make it worse by adding the past and the future, I just have to stop and breathe. remembering His past faithfulness and provision. running to Him in prayer. When I remember all God has done for me in the past; when I lean on His promises to care for me today and in the future; and when I surrender every anxious thought to Him in prayer … I have everything I need to know He will help me experience His peace through this moment as well. It’s hard to live one day at a time. It’s hard to let go of yesterday and refuse to worry about tomorrow? Especially for those of us who are naturally anxious. Like it or not, life is lived moment by moment. One day at a time. So, it’s up to you and me whether we will live one day at a time moments with peace or sacrifice them to on the altar of regret and worry. Celebrate today like it’s a bonus day. Take every peace-robbing thought captive and surrender it to God. Do what we are able to do today. Trust God to meet this day’s needs. And breathe in His peace. We can do this! You and I can live one day at a time with God’s help. It’s surprising how often the answer is, “no!” And if that’s the case, it’s not worth what it’s costing me in peace. I still slip into old bad habits occasionally. Father, It’s been so hard for me not to worry about this problem. I want it solved. Really, I’d like it to go away. But I don’t want trouble or problems or pain or heartache. Worry is a worthless waste of my time and You have so many good things for me to do. I’m sorry! Please forgive me for allowing the doubts of my weak faith to overshadow the truths I know from Your Word. You love me. You care about me. You know and want what is best for me even when it doesn’t feel like the best at the moment. Father, You see the beginning from the end and the end from the beginning. You know everything about me down to the very number of my days. So, today I give my worries and cares to You, trusting You to replace them with Your hard to understand perfect peace. And when I’m tempted to let my mind replay anxieties and concerns, please help me to focus on and trust in You. I will keep my thoughts fixed on You. I will, by Your grace and with Your help, trust You and Your promise to give me and keep me in perfect peace. Thank you, Father. In a world full of chaos and clutter … You alone are my perfect peace. Amen. I have a secret for personal peace. A.K.A. – How to avoid stress and enjoy peace without lying on the beach in the middle of nowhere. I can do the praying part (well, maybe not about everything but many things), tell Him what I need and thank Him. It’s that “don’t worry” part that’s challenging. Maybe you struggle with that part too. But when I keep reading in Philippians, I find the help I need. The peace God gives can help me control the way I think and feel. And I want that, don’t you? It’s not up to me to find peace. Isn’t that a relief? Any peace I could manufacture on my own is both fragile and fleeting. But God’s peace is a blessing that is as strong and lasting as the One who gives it. All I need to do is reject the pull of worry by giving every care and concern to God in prayer. To help me become more consistent in this process, I made an acrostic to help put the don’t worry, pray, and thank God into practice. Things that will help me stay ready to receive His gift of peace. What verses do you have memorized? Which verses are your favorites to carry with you that remind you of His peace and presence? Have you ever found yourself saying, “Where did that come from?” after some angry outburst or foot stomping frustration? Me too. Those outbursts can rob your peace, especially when there is someone to whom you have to apologize later. When you examine and identify your emotions first you can avoid acting out in ways that ruin personal and relationship peace. Why do I feel this way? Determine whether your feelings come from a physical problem or if they are just simple emotions. What if anything can I do about it? This may not even be your problem to solve. When is the best time to talk about this? Immediately or after you’ve had time to think and pray about it? This is where you pray, pray, pray about everything. The secret to peace that’s free of worry is an active prayer life. Taking everything to God and knowing nothing is too great or too small to talk with Him about. He cares. He loves. He is with you. He is sovereign . . . absolute, unlimited, reigning, supreme . . . able to help you and me accept this moment and consciously surrender it to His love. If you carry Pocket Promises, Examine your Emotions, Ask and Accept . . . I promise you will have something to celebrate. Rejoice every small victory and thank God for giving you strength, courage, comfort, and the blessing of His presence. Because I’ve seen it in others, and when I’m faithful to the “secret” I’ve experienced it myself. What do you think? Have you experienced the secret to personal peace? Thank you, Sheila and Ifeoma, for partying with us! 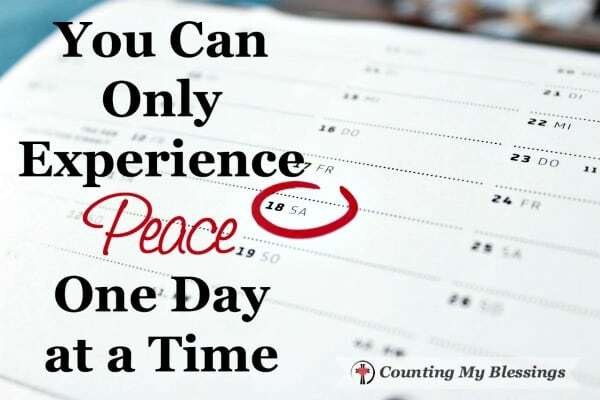 If you and I want to experience peace, we must live one day at a time. Peace can’t be tacked on to an agitated yesterday or pre-applied to tomorrow’s unknown. 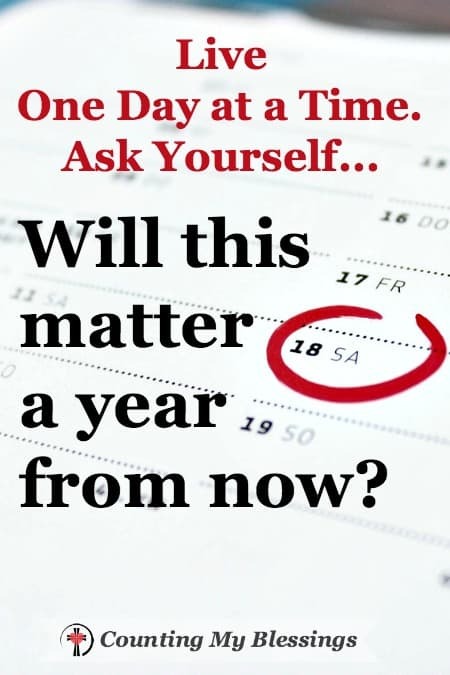 Have you ever gotten to the end of the day and regretted wasting it on worry and anxiety? I’m not sacrificing today’s peace and joy to the uncontrollable unknown. By God’s grace and with His help, I’m going to love my life by practicing peace. Treating each day like a gift, a bonus, helps me live intentionally. And intentional living today refuses to dwell on the past or the future. 2. Take every thought captive . . . reject guilt and worry. I recently read a great idea to seal today off from yesterday and tomorrow. Live in an airlock space. Imagine the door is closed to yesterday and you can’t open the next door until it’s time to move into tomorrow. Enter the space with thanksgiving and leave it with repentance. No guilt and no worry. Today, in the airlock space, is more than enough to handle. 3. Do what you are able to do today. Have you taken on more than you can handle? There are so many expectations on our lives today. Just taking care of a family pushes the limits and when you add a job or volunteering . . . well, it’s no wonder most of us come to the end of the day long before we come to the end of our to-do list. Remember to manage each day with grace. It’s okay to say no. It’s okay to set priorities. In fact, it’s not only okay, it’s God’s will. You can’t do everything for everyone. So, spend time with God and ask Him to help you manage your time according to His plans and purposes for you. Each day . . . there was just enough. Once a week, on Friday, they were to gather enough so they could rest from gathering on the Sabbath. God is able to meet today’s needs. He will meet today’s needs and even make it possible for us to take a Sabbath rest if we trust Him. With His help, I believe I can trust God’s ability to take care of me today. 5. Just breathe. Breathe in peace and breathe out conflict. When the moment is overwhelming and I’m tempted to make it worse by adding the past and the future, I have to stop and just breathe. Breathe out frustration, worry, and anxiety and breathe in God’s gift of peace through prayer. When I prayerfully remember His past faithfulness and lean on His promises I have everything I need to know He is able to get me through this moment as well. Do you find it as hard to live in the moment as I do? Isn’t it hard to let go of yesterday and refuse to worry about tomorrow? It’s funny, moment by moment is the way life is lived whether we like it or not. So, it’s up to us whether we will live those moments with peace or sacrifice them to regret and worry. The choice is ours. So celebrate each new day. Take peace-robbing thoughts captive, do what you are able, trust God, and breathe prayer. You and I can live one day at a time with God’s help. But the more I learned about her “weirdness,” the more I wanted to be just like her. You see, it was the way my Aunt Marion lived out her faith that made her weird. She watched for Jesus imminent return. She memorized Scripture so she’d know it well, in case she couldn’t read it someday. She had God’s “weird” peace. Her life wasn’t perfect. Aunt Marion had struggles just like the rest of us. Maybe even more than some, but no matter what was going on around her . . . everyone she met knew she loved her Lord. When life is bump free it’s easy to say, “God is good.” But when life is hard…when relationships are challenging and health is fragile, when finances are tight and days are difficult those are the moments where our faith gets real. That’s when you and I need God’s “weird” peace. Because it’s that weirdness, that impossible to explain or understand, supernatural, awe-inspiring peace, that makes people look into us and see Jesus. When observers see peace instead of the meltdown they’d be having . . . well, they just may want to know more about how to have a little of it themselves. Let’s pull it apart into bite-sized pieces. Blessing counting inspires joy. When I focus on God’s goodness and countless blessings, I can’t help myself…I’m just more joyful. 2. Be kind and considerate in all you do. Not only is kindness the right thing to do, I could almost be kind for selfish reasons. I’m more likely to receive kindness when I give it. Kindness defeats conflict. How about that for a peace maker? Try it. It works! Worry is a peace robber. It’s impossible to have the peace that surprises and inspires when I’m worried. Praying about everything is being constantly aware of God’s presence. Knowing He wants me to talk with Him about everything. Big, small, or in-between. 5. Tell God what you need. It’s not easy to know the difference between my wants and my needs. I believe it’s good to pray about both while I stay confidently content my Heavenly Father will meet my every need. 6. Thank God for all He has done. Thankfulness leads to satisfaction and satisfaction leads to peace. Praising and thanking God every day is a foolproof way to change my attitude. 7. Focus on what is true, and honorable, and right, and pure, and lovely, and admirable. As a recovering fearful worrier, focusing on God’s positive does not come easily for me but if I want peace I must keep counting my blessings and stay focused on His truth. 8. Think about things that are excellent and worthy of praise. It’s easier to notice people’s faults than to find reasons to praise and encourage them but if my goal is personal and relational peace then I must look for the good in others and tell them. 9. Live by the truths of God’s Word daily. I can know God’s commands and Jesus’ “Blessed are…” quotes but if I don’t apply them to my life it will be impossible for me to enjoy peace. I’ve lived too many years with anxiety. Peace is better. I want God’s “weird” peace that is hard to understand and impossible to describe. And the wonderful part is it’s possible. Are you ready to follow His 10 steps and experience “weird” peace? Are you ready to join me and be like my Aunt Marion? This is for you, the one hurting with silent grief. The one whose life has been altered by a loss or event that’s left you feeling broken and alone. You can’t talk about it. There are reasons known only to you. You see people grieving openly and you envy the love, support, and understanding they receive. But you grieve behind closed doors. In the dark. Alone. What are your kids up to these days? You’re uncomfortable meeting new people. Every introduction comes with the normal get to know you questions. And every question takes you back to what isn’t. To what you’ve lost. So you pause over every invitation. Will it be worth the effort? The reminders? The pain? No matter how silent grief feels . . . you are not alone! You belong to God – He sees you. Always under God’s watchful care, He sees you as valued, beautiful, and loved. Your grieving heart matters to Him. You belong to God – He knows everything about you. God made you. He calls you His child. Nothing in your life shocks or surprises Him. Even that thing you are grieving is known to Him. God cares. His hand of blessing is on you. You belong to God – He collects every tear. Not one tear falls without God’s care and compassion. He gathers every tear and records every sorrow-filled moment. Each one matters to Him. You matter to Him. You belong to God – He hears every prayer. Cry out. You don’t need perfect words or a carefully crafted format. Just pour your heart out to God and He will guide you and comfort you with His perfect peace. You belong to God – He is with you always. Always! Forever! God’s Spirit is with you. You are never without His comforting presence. Jesus promised. You belong to God – He will help you. Your Father doesn’t just offer you a listening ear, He will help you. His love never fails. When people make you feel judged and uncomfortable . . . turn to God’s love. You can count on His healing love. You belong to God – He will give you peace. Jesus, the Prince of Peace, wants to give you peace. Nothing you experience is new to Him. He was betrayed, rejected, abused, and denied. He knows and understands your pain and offers to replace it with satisfaction and calm assurance that with Him you will be okay. So, to you the one with silent grief. Your Father sees you, the Holy Spirit is with you, and Jesus offers you His peace. I needed this. I wrote it for me. If you’re blessed, I’m thankful. I wrote it for me because I know what it’s like to live with silent grief. I know what it’s like to feel judged and have people gossip and speculate. Like you, I need a regular reminder of God’s promises that I am not alone. I can’t control what other people think. But I can control what I think and when I struggle with silent lonely grief I have to go to God’s truth that gives me peace. God sees me. He knows me. He gathers my tears and hears every prayer. He is with me. And He will help me and give me peace. And God does those things for you, too. No matter what you’ve done or what has been done to you . . . my friend, you are not alone. You are loved and precious. More than you will ever know. Thank you, Mary, for partying with us! We have an Early Alert System in our community. An automated system that calls to let us know when a potentially dangerous storm is coming. I wonder if you and I would like an Early Alert System for our lives? Something that would let us know when we are about to be hit by a big ol’ storm? I don’t know about you but…I don’t think I’d want to know. Sure maybe I could make some plans and prepare but most likely . . . I’d just worry. No one really likes storms. Health problems. Relationship problems. Career problems. Parenting problems. Financial problems. And the list goes on and on and on. The truth is whether we get a warning or not, storms will happen and you and I need to know how to withstand them. For followers of Jesus, faith does not mean we have a home built in the land of no storms. We have something better, a home no storm can destroy. When I started writing this, I thought I’d focus on the Scripture account where Jesus calmed the storm. But I just couldn’t think of anything to say that you haven’t heard a thousand or more times before. And truthfully, although it’s nice to think about God simply speaking a word and stopping the storm, all you have to do is look around to realize even when you and I cry out . . . sometimes the storm will still rage around us. With or without an early warning system, there are some things you and I can do to prepare in advance for the next storm. And there will be a next storm. Wow! That thought used to terrify me. What will it be? How will I get through it? When will it happen? What if? That is NOT the right thoughts for foundational preparedness. Know and Trust God’s Promises. Lean into God’s Almighty Power. This encourages me to stay connected and pay attention to what God is doing. Whatever your situation! He is almighty! Live God’s Personal Purpose and Plan. Don’t compare your life to anyone else’s. Good or bad! God created you exactly the way He wanted you. He has a plan for you. Trust Him. He is able to equip you for anything He allows. (Wow, I wish I had believed that years ago.) It’s true! God has proven His ability to meet my needs. Rarely early but never late. Right on time equipping to be used for His glory. Praise Him for All He’s Done. Remember and celebrate the times God gave you strength and met your needs in the past. When I look at a storm through the lens of past experiences, I know God has gotten me through worse trials than the one I’m currently facing. Remembering gives courage and hope. Ask God to calm the storm. Sure. Ask Him to make it a thunderstorm, not a hurricane. Absolutely. Ask Him to make it a thunderstorm, not a hurricane. Absolutely. Ask Him to help you know and feel His presence. Ask Him to give you strength and courage. Ask Him to give you everything you need to weather the storm. Father, I’m afraid. This storm You’ve asked me to live through is hard. And if it is Your will, I ask you to remove it. But if not, please give me everything I need to weather it safely. Please give me courage and strength. Allow me to feel Your presence and peace. Please help me. I need You. You promised to never leave me or forsake me. You promised to be my refuge and strength. You promised I could trust in You to meet my needs. I need You, my Rock and my Foundation. Thank you for the many times you have helped me through past storms. I believe You will meet every need I have today. Thanks and praise now and forever. Amen. Storms are frightening. But with the Holy Spirit’s help, you and I can have a home built on rock solid faith in Jesus Christ. And that it a foundation that will never fail. I’m excited to dig deep into peace this month. They just didn’t translate into my everyday living. I believed Jesus had overcome the world for my eternal future but I didn’t believe His overcoming meant I could be an overcomer. I doubted the power of God’s peace in my life. Life is hard and there are plenty of things to worry about. Add things you hear on the nightly news and it’s not surprising that more people are being medicated for depression and anxiety than every before. I’m going to make myself vulnerable here and tell you that although medication made me feel better it wasn’t able to give me peace. God’s peace finally came as the result of a long journey through of grief and pain. I needed His help just to get through the day. So, I spent every free minute reading my Bible. I cried out and God poured out. He graciously allowed me to feel His presence and bit by bit allowed me to know His power to give me peace . . . incomprehensible unimaginable peace. So today, I want to share 7 verses I hold close when I need to remember God’s peace even when life is hard. Wherever you go and whatever your circumstances, you are never alone. God knows every detail of your struggle. Nothing is hidden from Him and nothing surprises Him. He leads you. He protects your soul. A blessing of peace with Him. Your Spirit is everywhere I go. I cannot escape your presence. If I go up to heaven, you will be there. If I go down to the place of death, you will be there. even there You will take my hand and lead me. Your strong right hand will protect me. God is on His throne. He reigns over all things. Nothing happens outside of His permission. That has always been hard for me. Why would God allow His children to suffer pain? But I’m learning to trust the bigger picture of His will and trust that God is able to carry me through whatever He allows. He is in control. A truth of unlimited peace. It can be hard to have an eternal perspective with your feet planted in the present. But with God’s help and your focus on enjoying His forever presence doing today with peace becomes a blessed possibility. A promise of eternal peace. The forever home God is preparing with Him includes the promise that every tear will be wiped away, and there will be no more death, sorrow, or pain. A hope of enduring peace. Quiet time with God is like a hedge of peace around each day. Laying concerns down before Him and trusting He will give everything you need that day. The Lord is always at work around and within you. He is able to give you peace even when everything around you feels overwhelming. A prayer that gives peace. God is for you. He loves you. He wants you to enjoy true and lasting peace. So much so that He provided everything you need. Everything. A gracious gift of peace. I hope these verses bless you with peace. God is . . . with you, sovereign, eternal, preparing, guarding, accomplishing, and loving. He is able to give you peace. Enough to overcome any problem you face today. Peace – that tranquil feeling that flits in for occasional moments and then disappears for far too long . . . everyone wants it but few have it. I crave calm. No thrill seeker here. I want peace in my relationships and peace in my heart and mind. But even as we talk about wanting peace, I wonder if we really know what it is? What is this thing we all want but find almost impossible to achieve? So, this month we’re going to take a closer look at this thing called peace that everyone wants but finds almost impossible to have and keep. The simple definition is . . . peace is the absence of conflict. Honestly, that doesn’t really satisfy me. It feels like there’s something missing. I need to dig deeper into this idea of peace. I want to know more about having peace with God and finding peace in a sinful world. I want to know how to have peace when life gets bumpy and the differences between peace-makers and peace-keepers. Once again, a word I use often but still have so much more to learn. Let’s start with definitions from . . . The Mirriam-Webster Dictionary. A state of tranquility or quiet. Freedom from disquieting or oppressive thoughts or emotions. A period of mutual concord between governments. But the reality is there are plenty of things fighting to rob us of peace. And when I look at that list it’s not surprising that maintaining a sense of peace often feels almost impossible. Psychologists say there has been a “dramatic spike” in the number of people who suffer with anxiety disorders in recent years. I wonder, is it possible to have personal peace? For calm contentment to replace conflict, worry and fear? Which is why I have to start where I’ve started every month . . . vertically. The Hebrew word shalom is translated as peace, but it so much more than that. According to Strong’s Concordance – Shalom means completeness, wholeness, health, peace, welfare, safety soundness, tranquility, prosperity, perfectness, fullness, rest, harmony, the absence of agitation or discord. Shalom comes from the root verb shalom meaning to be complete, perfect and full. I love that! That’s the peace I want. You too? Peace that makes you complete! The kind of peace that makes us complete! Wholeness that can only come from God Himself. Because sin ended wholeness. It’s the thing which makes peace impossible. But God who is gracious and merciful gave His plan to restore peace immediately following that first sin. You and I sin but God offers peace. Jesus, the Prince of Peace, is the fulfillment of God’s plan to restore peace. It overwhelms me to think of Jesus suffering, death, and resurrection that removes the remnants of my rebellion and makes me right with God. My past is completely forgiven. No sin too great. God’s amazing grace! Jesus promised the person of the Holy Spirit who would remind people like you and me of all God has done for us and all He promises for the future. I need time in God’s Word and prayer. It takes my focus off my struggles and replaces them with God’s promises of hope that give peace. God uses my time spent with peace-filled followers of Jesus like good medicine. It strengthens my spirit and soothes my soul. God fills me with His presence as He surrounds me with His truth, His grace and mercy, and His love. I had an interesting thought the other day. If someone else stepped into my life for a week would they find peace? Would they find my calendar too full? Would they find my relationships encouraging? Would they find order or cluttered chaos? Would they find evidence of God’s indescribable peace? Is my life set up for peace or are there things I need to change? Where do I need to get more intentional about making myself more available to the ways God wants to give me His peace? I’m hoping you’ll join me on this journey toward peace . . . toward shalom. and have mercy on you. Thank you, Alison, for partying with us! I’m not a huge fan of the kind of sayings people put on church signs. Although there are countless verses that tell us not to be afraid . . . there are lots of things in life that are understandably frightening. That’s truth. You and are legitimately afraid of evil in this sinful world. It makes me wonder if we couldn’t be doing a better job of reaching out to people who are afraid. And there are more of them than you think. I often write about God delivering me from fear, but I have to tell you . . . not one of the above quotes would have helped me during my fear-filled years. My first memory is one of fear. I still picture my two-year-old self standing next to my grandmother watching out the window as paramedics loaded my mother into an ambulance. Until then, my little world was my parents and my grandparents and aunt who lived upstairs. But with everyone working and going to school – I had to stay with my great-grandparents until my mom was well again. I learned that day . . . life can change in an instant. And I was afraid. Once fear is a close companion it doesn’t leave because someone says . . . don’t be afraid or you need bigger faith. Frightened people know that and believe me, they’d give up fear if they could. Listen and Care – Don’t tell them not to be afraid. In fact, sometimes the best thing to say is, “I’m sorry you’re going through this. Would you like to talk about it.” Then listen with a heart that cares. Pray – Offer to pray for them. Better yet, offer to pray with them. Jesus understands fear. Spend some time with Him in Gethsemane. (Matthew 26) When He was afraid He went to His Father. So, pray with and for your fear-filled friend to the One who is able to give them peace. my mother’s traumatic fall and death weeks later. And I learned something through those hard experiences. God really was and is greater than my fear. He was my source of strength. My peace that was beyond understanding. My hope that in every circumstance He was with me. God made and makes His presence known in my life. But not through some quip on a church sign or picture on Pinterest. God did it. He gave me strength and peace as people prayed. As I prayed. Who is afraid? Who needs your prayer today? Pray for them. Scripture over them. So, pray these for yourself. Pray them for your friends. Pray that God will make His presence known and give the peace only is able to give. Here’s free printable of these prayers so you’ll have them whenever you need them. And remember, if you’d like to leave a prayer request click here. Last Friday night as terrorists hit Paris . . . fear hit the hearts and minds of people around the world once again. And peace feels impossible. The doctor’s prognosis is grim. And peace feels impossible. Your child’s behavior is a daily battle. And peace feels impossible. The holidays approach and your family isn’t split it’s exploded. And peace feels impossible. Your spouse wants a divorce. Your friends betrayed you. Your debt feels insurmountable. Your _________. And peace feels impossible. That’s when you need God’s gift of peace greater than your impossible. Peace that goes beyond your understanding. Possible peace when you need it most. Ask – Pray and ask God to give you His peace. He wants you to know His peace. Asking Him helps you remember that He wants you to have it. Trust – Believe God will give you His peace. It is always available. By the power of His Spirit He will give it to you. Live in Peace – Work for peace. Slow down. Practice patience. Simplify. Let it go. And repeat #1–3. He still does. He calms, restores, and forgives. He gives perfect possible peace. Father, Thank you for giving Your peace. Please forgive me for looking elsewhere for peace or for trying to achieve it myself. Life has taught me that outside of You true and lasting peace is impossible. Thank you for allowing me to learn that You want me to know and enjoy Your peace. Help me to trust You completely. Help me to rest on Your promises. Grant me Your peace even and especially when the circumstances seem impossible. In the name of Jesus, the Prince of Peace. Amen. God promises peace in His presence. Here is a collection of 25 verses that will bless you with the promise of peace. Here is a list of my favorite verses on God’s gift of peace. Feel free to copy, print, or use it as you’d like. Which verse speaks peace to your heart?